Effortlessly blending mid-century design with today’s fashion, this loveseat is a standout piece. Tapered accent legs set a sturdy and confident demeanor. 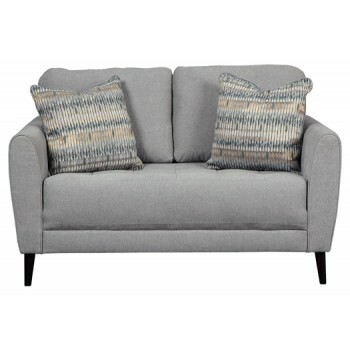 Casual, soft upholstery with in vogue neutral gray tone is easy on the eyes and hands. Mod cushion with bench-like seating is extra thick for extended comfort. And with metallic yarns in contemporary pillows, this loveseat is gleaming with style.